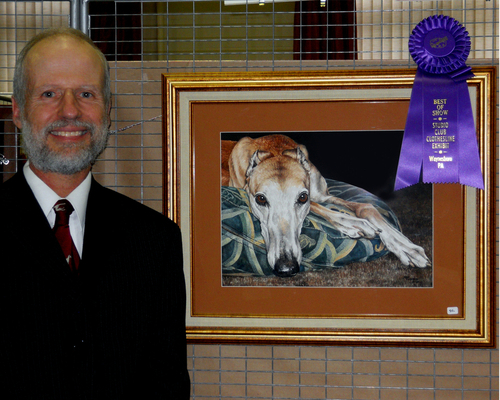 I was honored to receive the "Best of Show" award at the 60th Annual Waynesboro Studio Club Show. 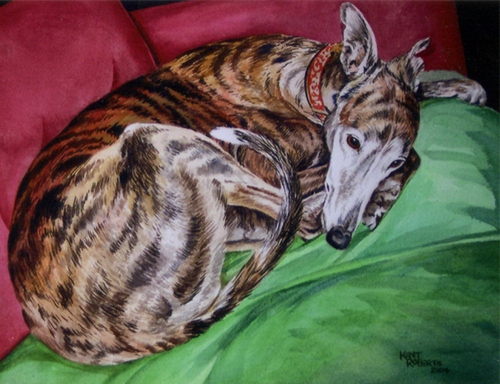 My painting of my first Greyhound "Brooks" won in a field of 180 entries. 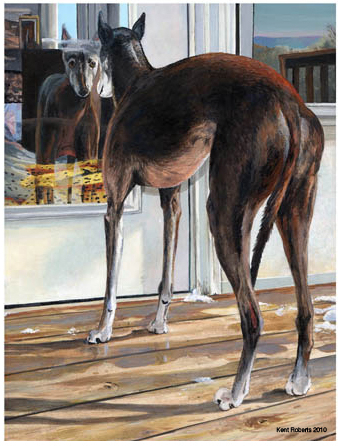 I was honored to have a close-up of my painting (based on my Greyhound Nike) on the cover of Celebrating Greyhounds Magazine. 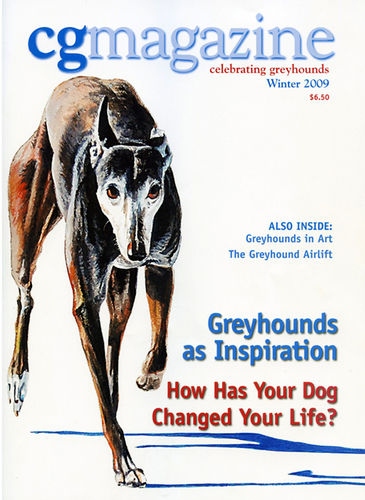 My article "Beautiful Obsession: How Adopting Greyhounds Inspired My Art" appeared in the issue. 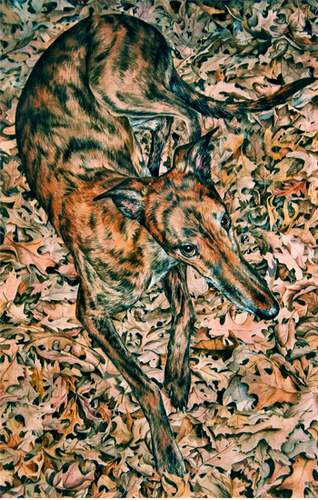 This painting of my Greyhound Nike won first place in the Animal Portrait division of the 39th Annual Franklin County Art Alliance show. 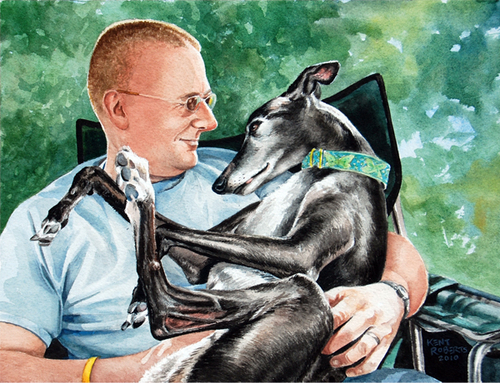 Greyhounds aren't usually "lap dogs"...but this little girl only has eyes for Dad. Handsome Max relaxes with his favorite toy. 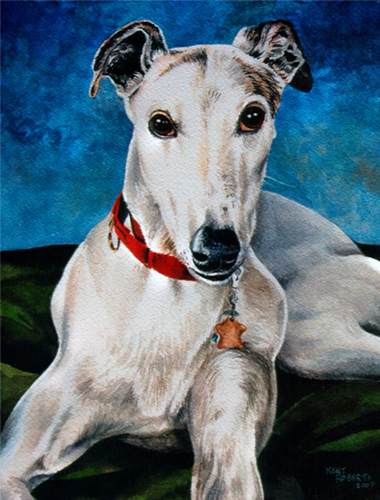 This beautiful 13 year old Greyhound found a loving home with Peggy and Lew Levin...founders of Personalized Greyhounds, Inc.
Special memories are captured forever in luminous watercolor. Sometimes an extreme close-up is the key to a dramatic portrait. 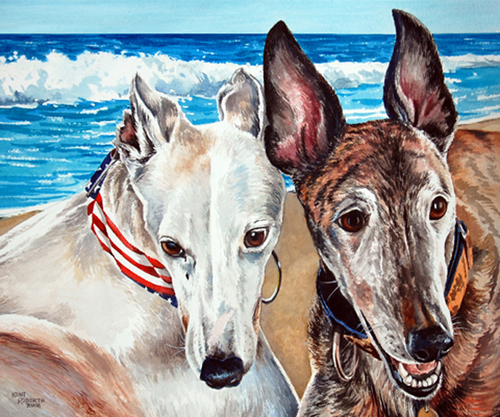 Three handsome Greyhounds enjoying a day at the beach. 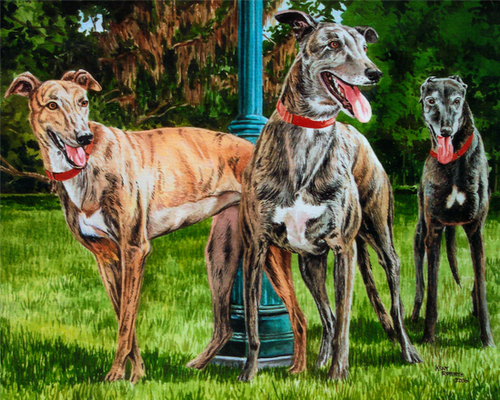 Painted at a custom size to best capture these these great Greys. 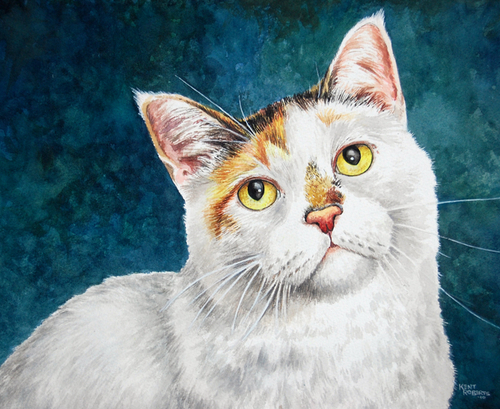 Beautiful Josie, owned and loved my Raymond and Pat Martin. 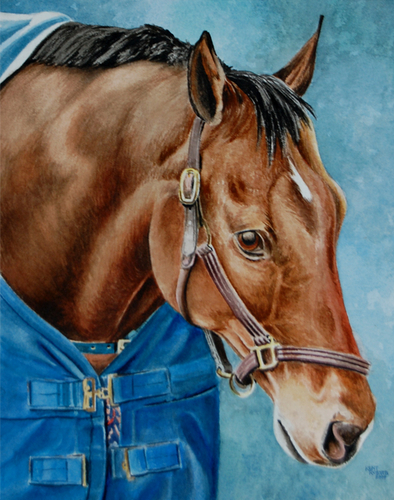 A beautiful retired race horse. Now living the good life with people who love him. 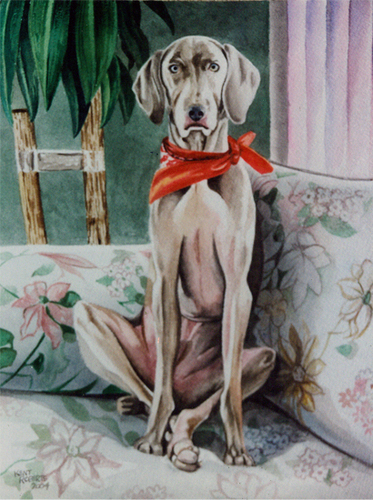 Background colors are chosen that will enhance the subjects. Handsome 12 year old ex-racer Brooks relaxes on a comfy bed. Retirement has it's rewards. 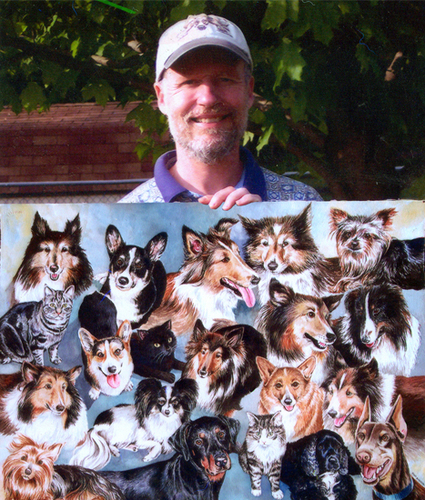 20 pets in one big painting! Special orders welcome...email me for details. Are her eyes beautiful or what?! 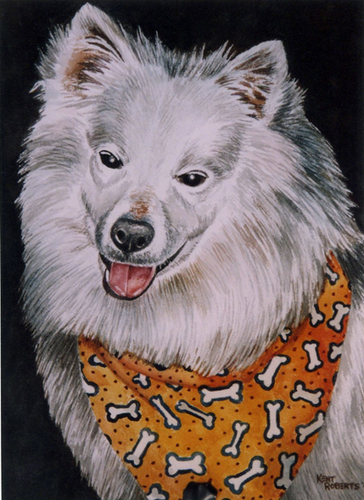 White dogs are never just "white", but have many nuances of colors. The dark background makes the image really "pop". 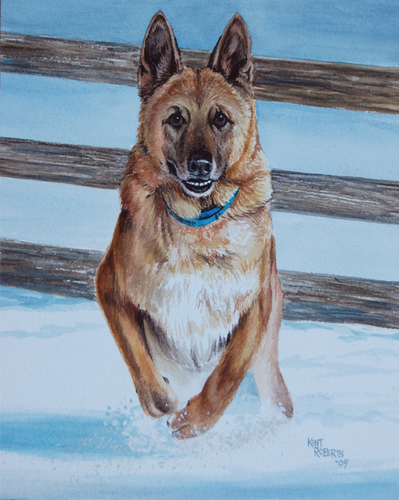 A beautiful Belgian Shepherd takes a romp in the snow. 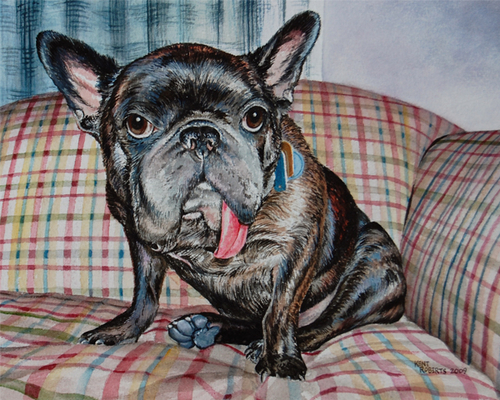 Pet portraits capture fleeting moments forever. Attention is paid to every detail and color nuance. 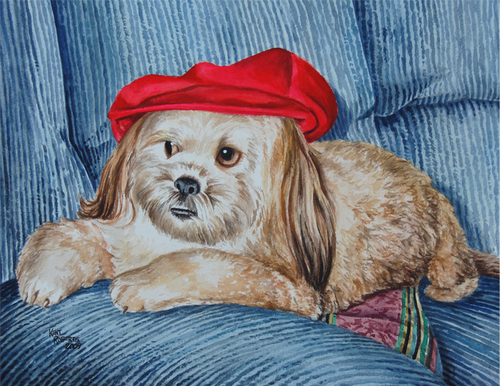 Buffy looks jaunty in hat bright red hat! 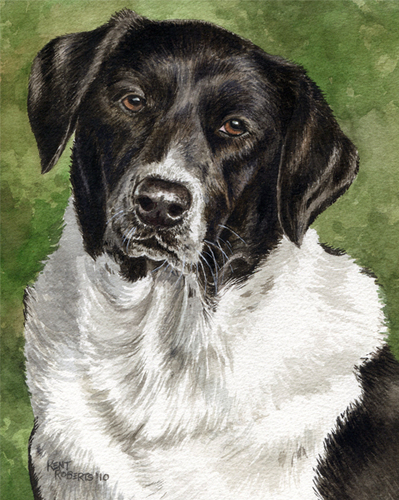 Pet portraits capture your best friend's personality. Can you look at this little guy and NOT smile? 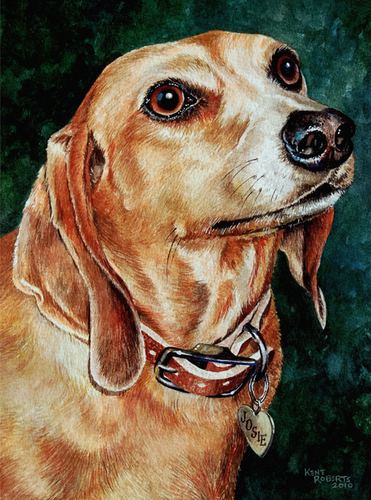 Pet portraits are a lasting tribute to your best friend. 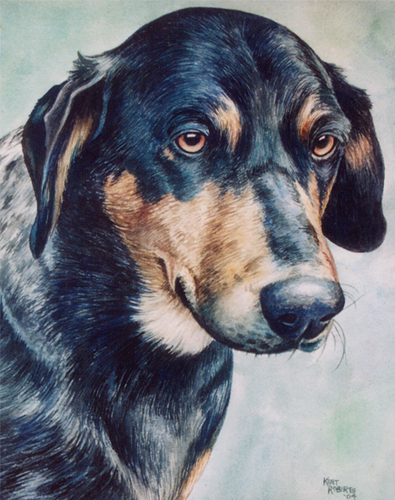 Handsome Dallas as a puppy, middle aged and a senior...painted from three photos. 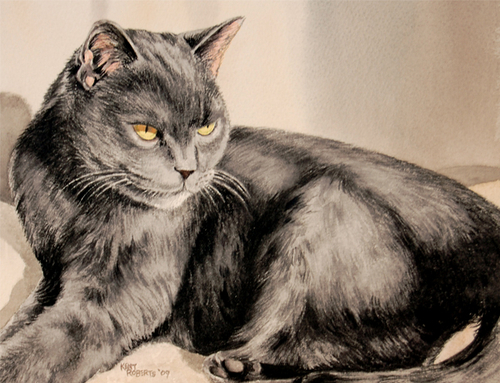 Yellow eyes come to life when the many subtle color variations are captured. White fur isn't pure white....but has nuances of other color throughout. 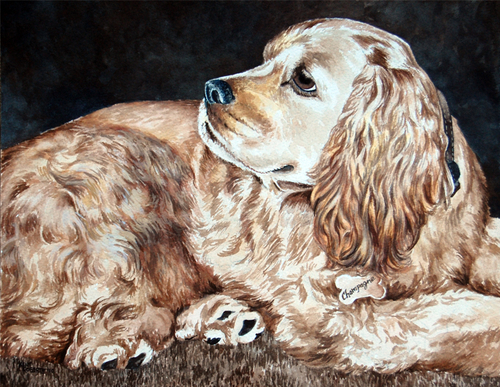 A beautiful cocker spaniel contrasts dramatically against a dark background. The beautiful Lulu looking at home in the kitchen...is it "treat time"? 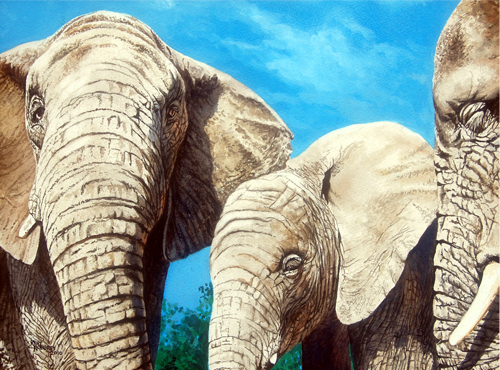 Any background can be included in your painting. 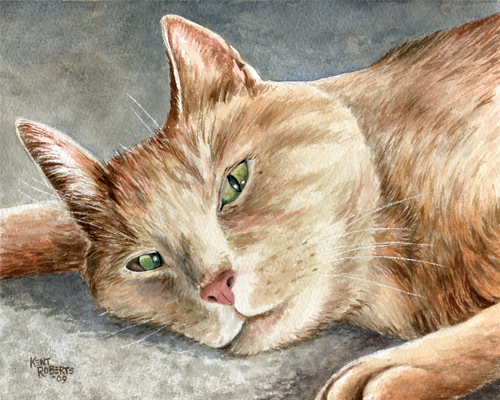 It's the details in your painting that will bring it to life! 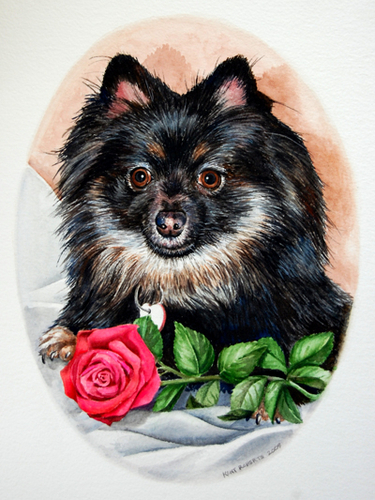 A rose was added to the painting of this beautiful dog, enhanced by a vignetted background. 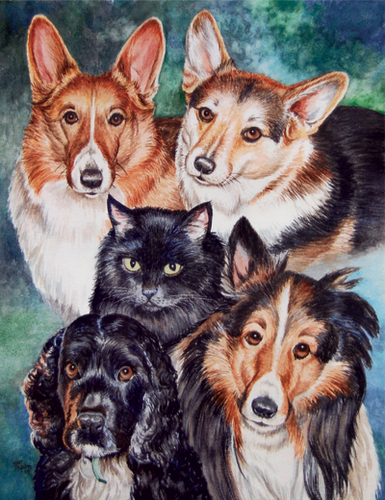 Five beautiful pets organized into a montage. 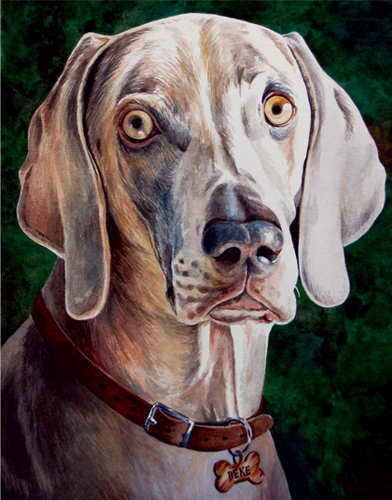 The details in the eyes bring the pet (and it's personality) to life. 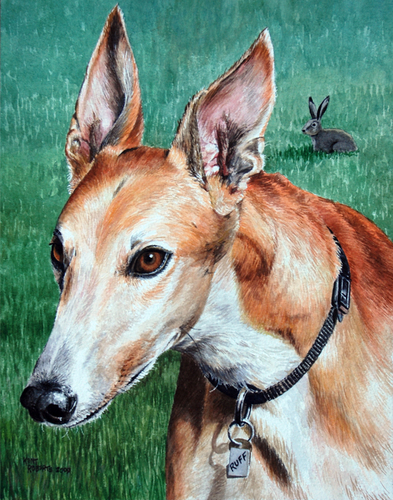 Handsome Ruffin Red E has his ears up. 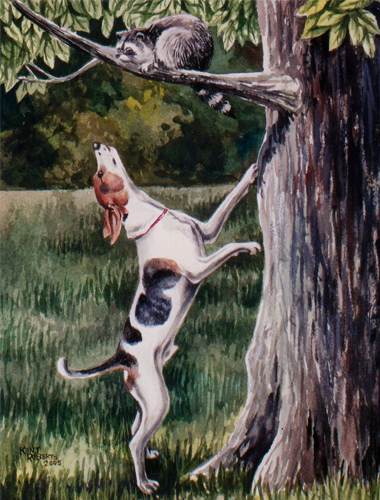 He must have discovered that rabbit sitting in his yard. 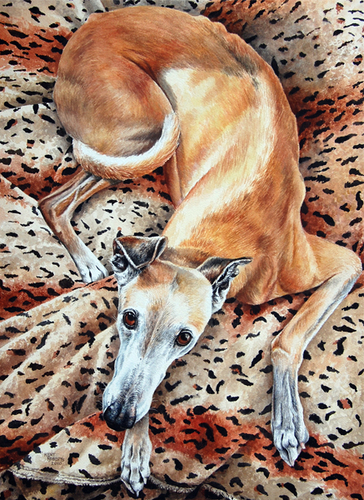 Greyhounds know how to relax! A variety of textures make a painting a feast for the eyes. The stunning Miami dappled by sunlight. 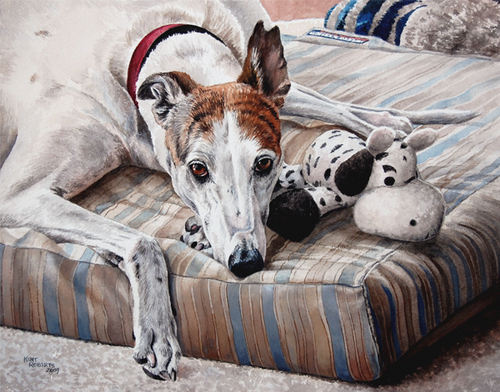 Capturing the feeling of light and shadow are key to realism in pet portraits. 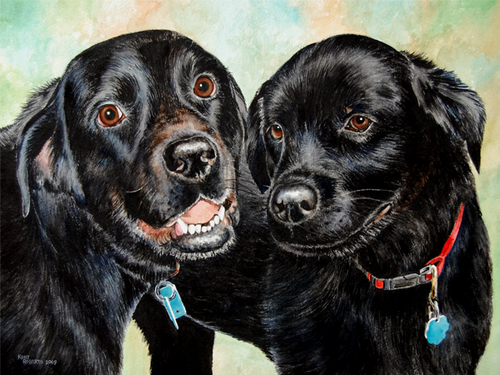 Keep your buddy's memory alive with a pet portrait. Two little buddies enjoying the same chair. 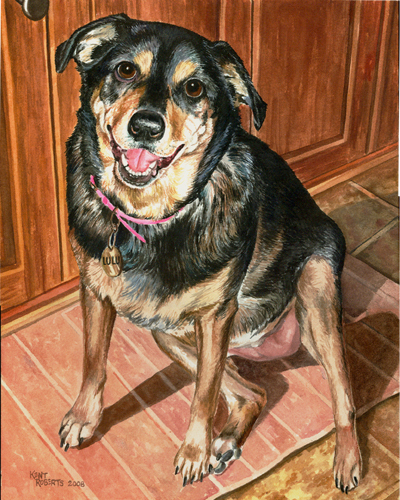 Capturing all the details and nuances of a scene are the secrets to beautiful pet portraits. 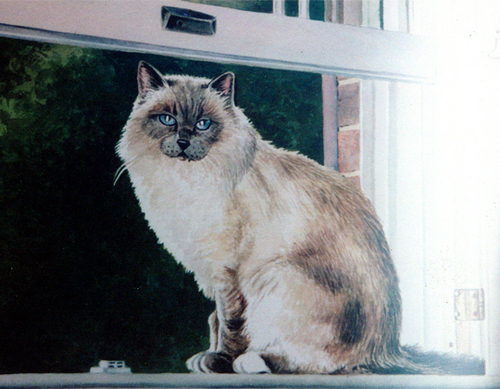 Two (or more) photos can be combined in one painting. 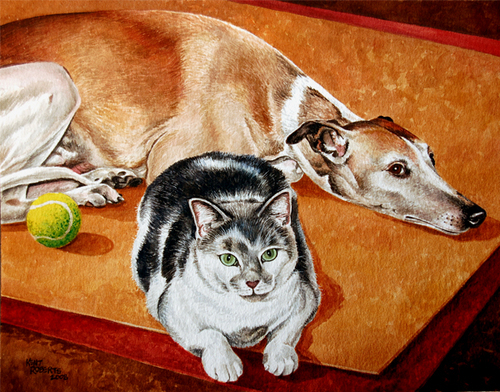 A whippet and a cat painted from two different photos. Color choice and composition are used to bring your portrait to life. 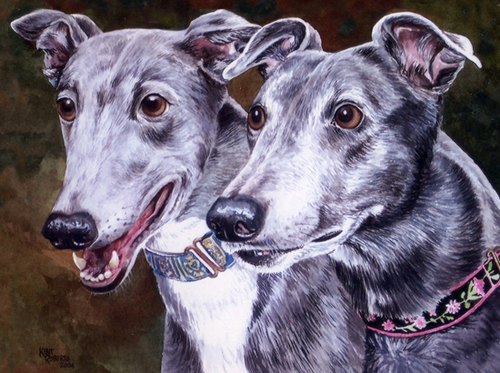 Grandmother, mother and daughter...three beautiful Greyhounds adopted by David French. 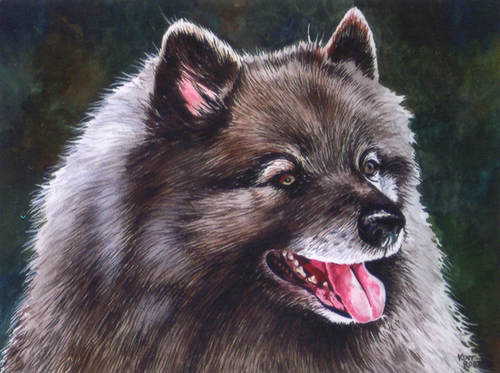 Any backgound can be included in your painting. 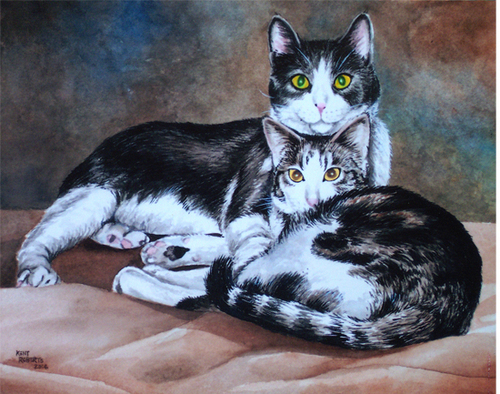 A painting is a cherished memory of a faithful friend. 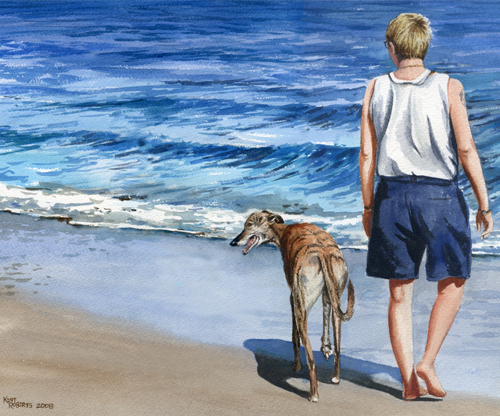 Painted from three photos...one for each Greyhound, another of the beach...to create one beautiful painting. Even the most subtle of details will be captured in your portrait. 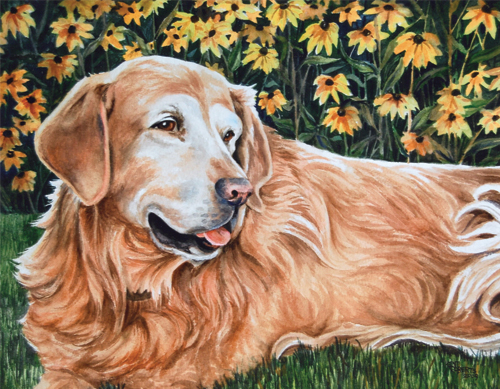 The beauty of this pet is enhanced with the inclusion of sunflowers. 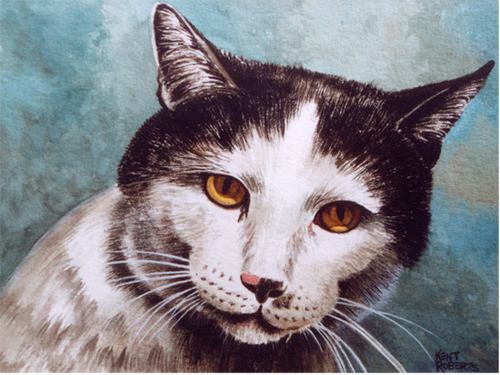 A likeness AND personality are captured in each painting. 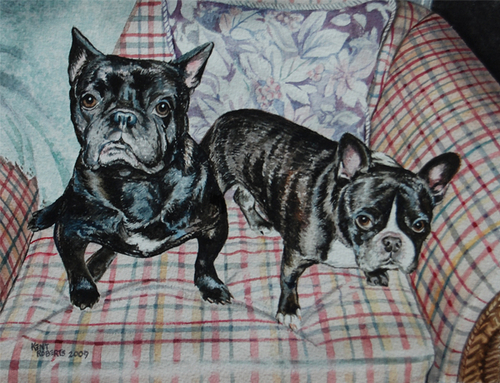 Two beautiful dogs...painted from two photos into one stunning painting. 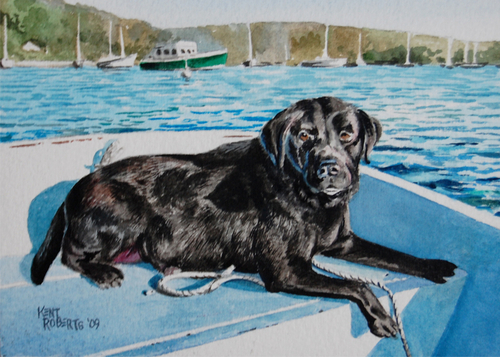 A sunny day, beautiful scenery and a stunning dog...the perfect painting! 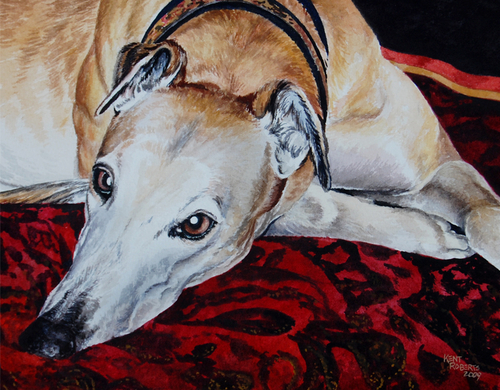 A study in reds...a beautiful Greyhound looks at you soulfully with large doe eyes. 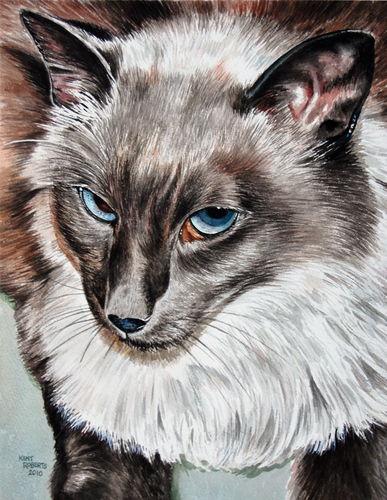 Capturing a pet's personality is what makes a painting a work of art. 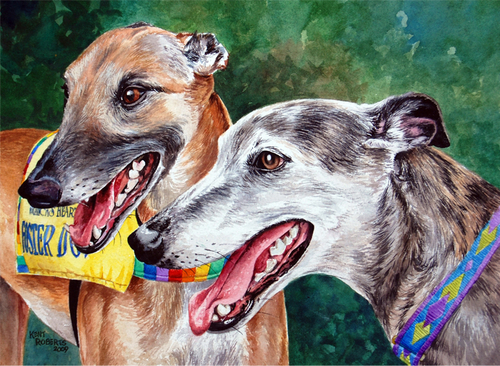 Two beautiful retired greyhounds...now living the "good life" with their adoptive family. 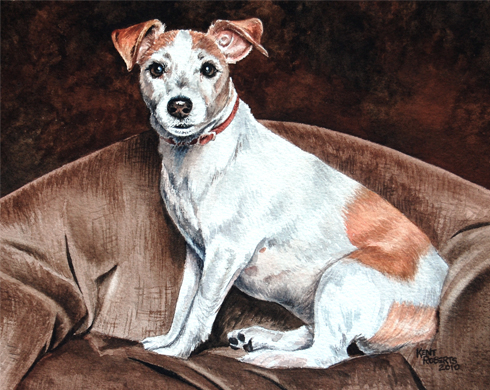 This cute little dog is sitting pretty on it's favorite chair. 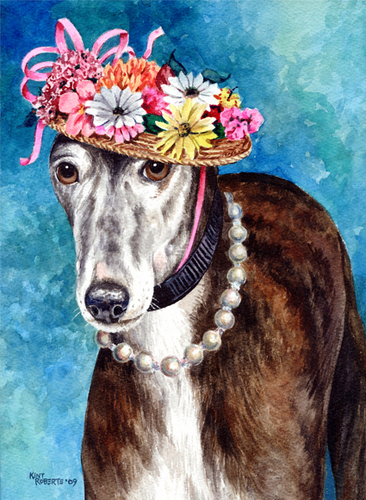 Granny is ready to strut her stuff in her fancy hat and necklace. 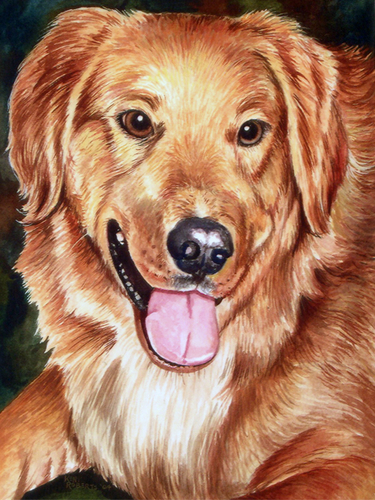 Pet portraits are a way to remember the fun times you had with your furry friend. This dog has the raccoon just where he wants it! 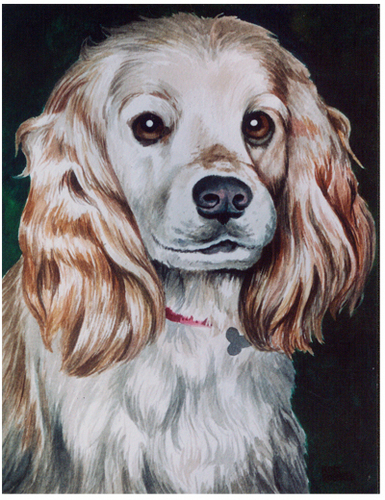 Painted from just a photo of the dog...any environment can be created! 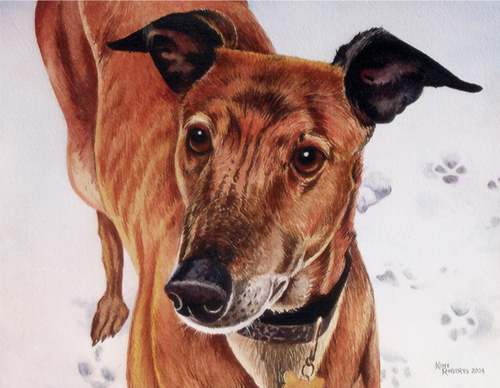 A beautiful reddish Greyhound pops out from a snowy background. 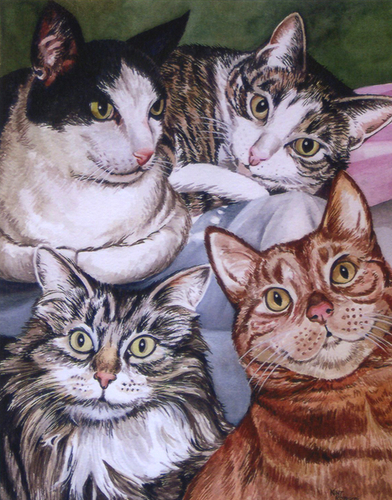 Four beautiful cats in one painting. Four different photos incorporated into one beautiful watercolor. 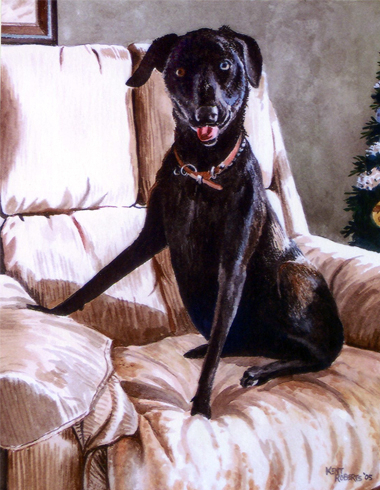 This stunning black dog contrasts nicely against his favorite white chair. 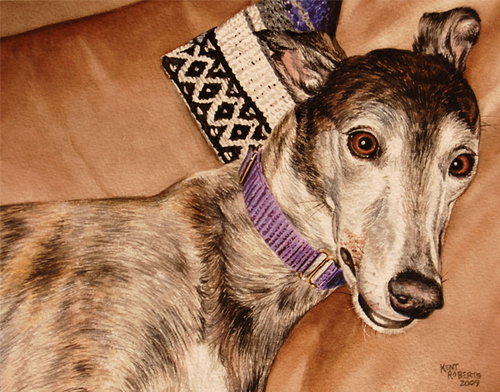 The expressive eyes and relaxed expression say it all...this is a happy girl! 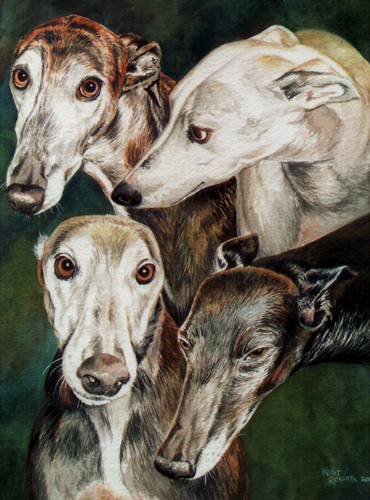 Greyhounds know how to relax! 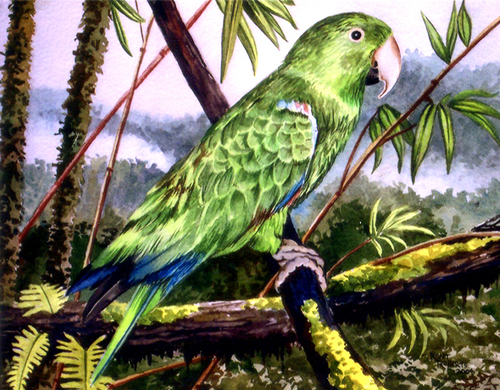 The bird was painted from the customer's photo. 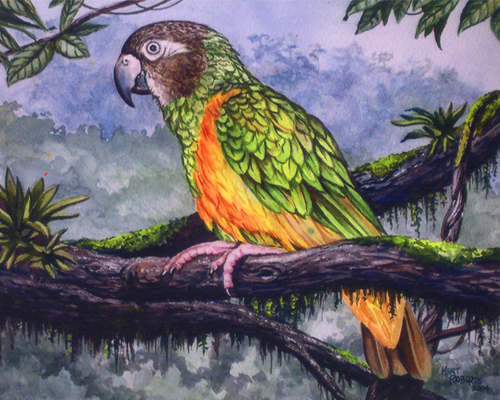 The background was painted from a photo I took in Costa Rica. 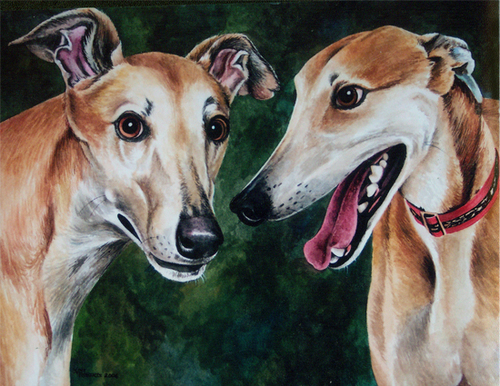 Gray is actually a rare color for Greyhounds...and when they are gray, it's referred to as blue. These two beauties share this unique coloring. Unique apparel is often part of a beautiful portrait! 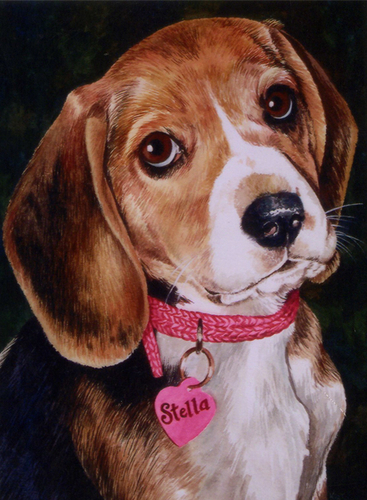 Stunning Stella caught in luminous watercolor! 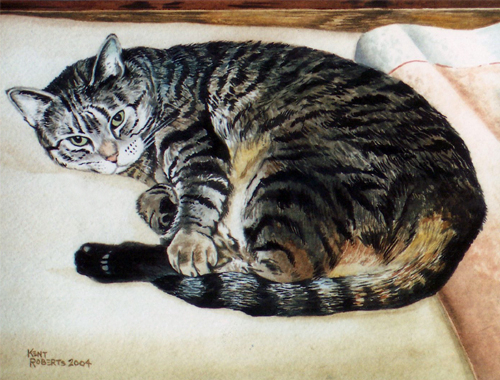 Cats sleep a lot! This one looks like it's just about nap time. 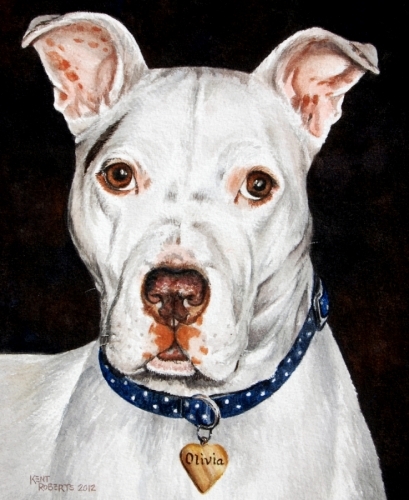 Watercolor portraits capture your pet's personality (and good looks)! 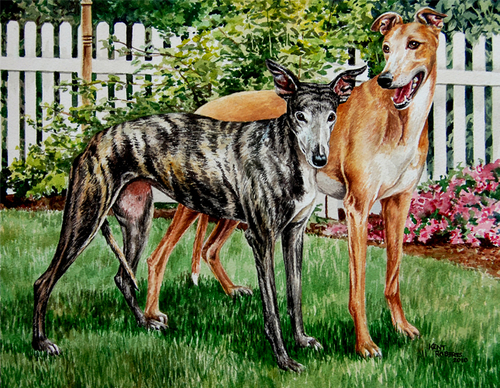 Two beautiful Greyhounds enjoy a Spring afternoon in their backyard. 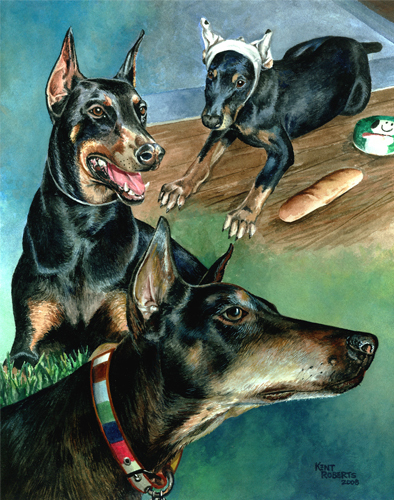 One painting created using four different photos as reference. This is the beautiful MoonPie. 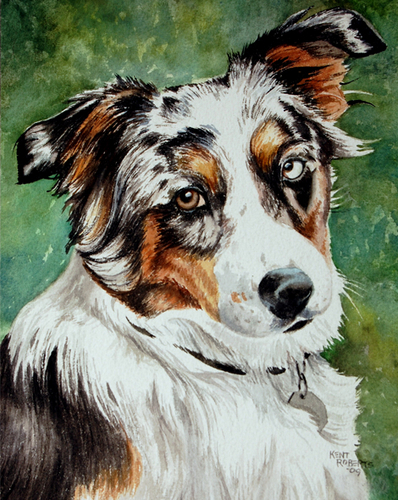 Even in a "black and white" dog, subtle colors are captured in watercolor, adding to the realism. Ok...these aren't pets. In 2010 a "landmark" in our area burned down...Mr. Ed's Elephant Museum in Orrtanna, PA. Many of the thousands of elephants in this unique collection were lost forever. 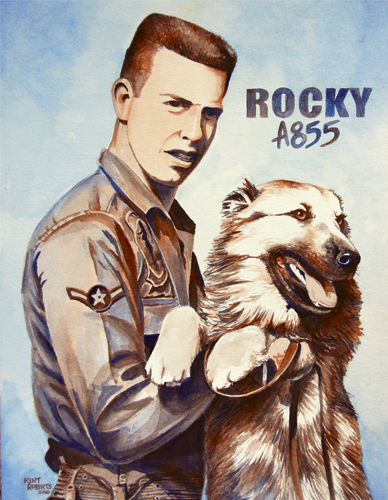 I decided I wanted to do a painting for Ed's museum when it reopens this Fall. Learn more about this unique attraction on Mr. Ed's Elephant Museum's Facebook page. Handsome Mr. 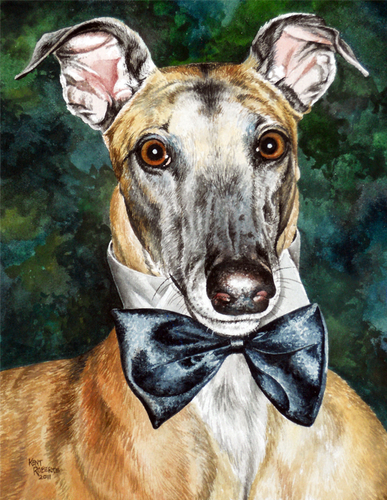 Blitz is puttin' on the Ritz in his snappy bow tie! 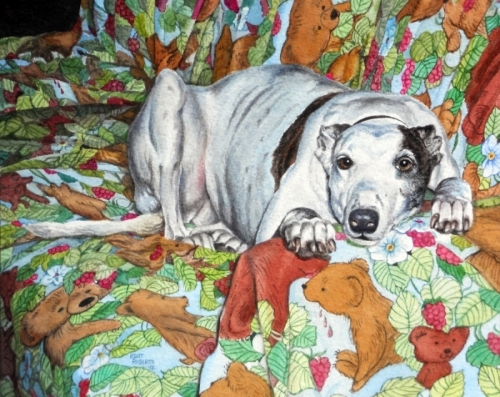 Is anything cuter than a beautiful Greyhound gazing at you soulfully...on a teddy bear patterned sheet? I don't think so. This painting was fun to create...lots of neat details! This is comfortable? 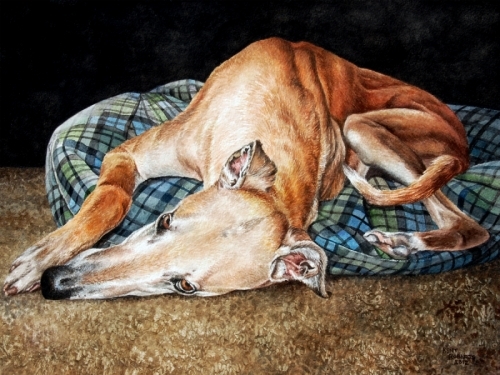 Greyhounds can twist themselves into amazing shapes...and then take a nap! This handsome boy is minutes from catching some ZZZs. 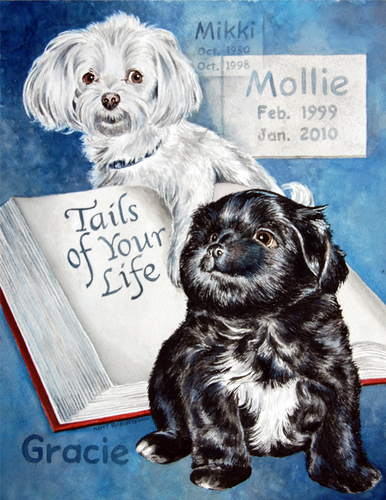 Pet portraits pay tribute to our beloved pets...both living and those who have crossed the Rainbow Bridge. 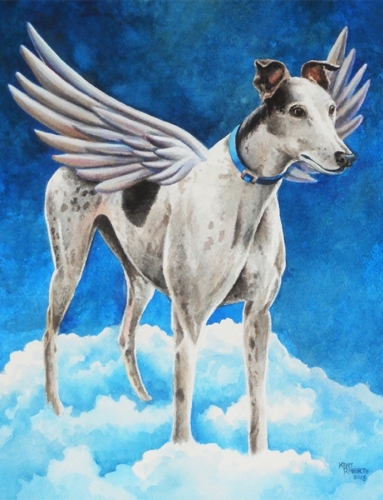 Our pets truly are angels with fur...so what a perfect tribute to a cherished friend who has crossed over the rainbow bridge.